First of all a tremendously personal item from the late, great Carrie Fisher (October 21, 1956 – December 27, 2016), author, actress and Hollywood icon, best known for her role as Princess Leia in the Star Wars series. The passport was issued in 1983 and was expired in 1993. Her passport picture is stunning! This one-of-a-kind collectible is one of Carrie Fisher’s most personal possessions and reveals her life through her love of travel. She traveled the world on this passport, issued May 26, 1983 just after finishing filming “Return of the Jedi,” at first with her new husband, Paul Simon (1993-1994), and then as she wrote the her best-selling novel Postcards from the Edge (published in 1987 and released as a film in 1990 starring Meryl Streep). During this time she also starred in Hannah and Her Sisters (1986) and When Harry Met Sally… (1989). The passport is chock full of visas, stamps and revenues from various destinations, including UK, France, Greece, Sweden, Hungary, Italy, Singapore, China, India, Egypt, Australia, Thailand, St. Maarten and Trekking in Nepal! Which proofs she have seen the world. 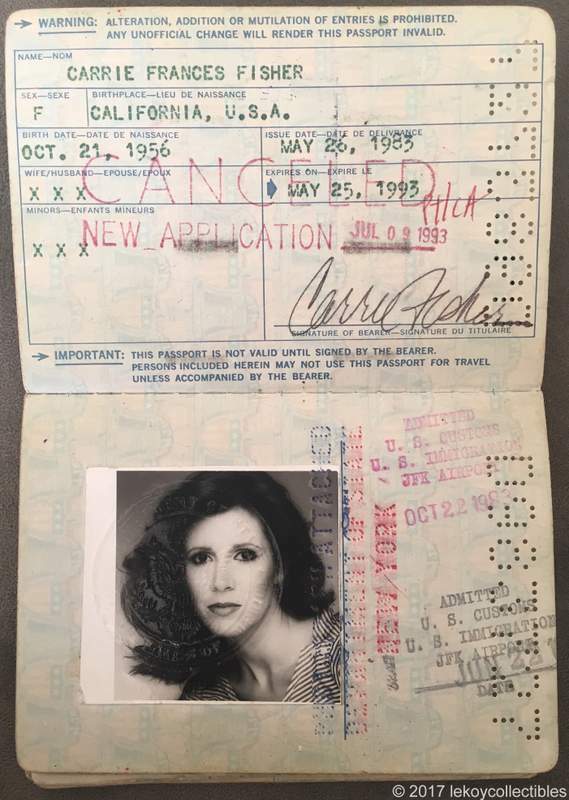 U.S. Passport issued to CARRIE FRANCES FISHER, signed (“Carrie Fisher”), issued May 26, 1983 and expired May 25, 1993. 23-page printed booklet with 20+ visa extension pages, various stamps and revenues, minor rubbing otherwise excellent condition. Canceled stamp and new passport application made on Jul 9, 1993. It’s really strange for someone to sell this. How did they come by it? Was it stolen? Was it a gift from Carrie Fisher? If it was, why would you try to make money off of it? Not cool. Hi Bella, you might wonder and find it “not cool” but celebrity passports are auctioned all the time as memorabilia and there is nothing wrong with it. They are of course not stolen (wonder why you think that) and come in the most cases direct from their families. So don’t worry and enjoy to see her passport with this wonderful passport picture. Cheers Tom.